I love serums and facial oils and I've written many reviews over the years. For me, facial oil is a key part to my skincare routine. I use them for cleansing and moisturising. I believe the key to finding the correct one is to know what your skin needs and focus on understanding ingredients. I've researched which ingredients are recommended for dry, sensitive and eczema prone skin and from this I know exactly what to look for when choosing a product. Top of my list is rosehip, plum kernel, jojoba, seabuckthorn and apricot but there are many more. 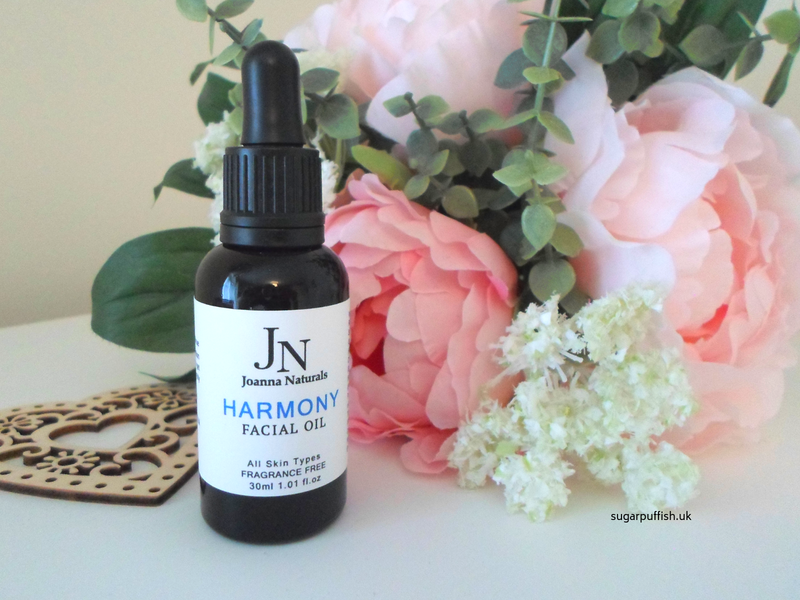 I had the pleasure of testing Joanna Naturals Harmony Facial oil in the formulation stages so it's lovely to be able to write about the final product. Jo is the founder and she's an aromatherapist with a passion for skin health. Harmony has been formulation for very sensitive and reactive skin so it's completely free from essentials and fragrance. It's suitable for all skin types but ideal for mature damaged skin. For any reader not familiar with me, I am over forty with damage from dermatitis so I feel able to review the product with experience. I always find it a bold move for brands to step away from essential oils when they are the core to their range and passion. I know many people enjoy aromatherapy but essential oils do contain naturally occurring allergens so care is needed with some problematic skin types. Harmony has a lovely blend of ingredients which include some personal favourites - rosehip, argan, raspberry seed, jojoba, pomegranate and kiwi to name just a few. The formulation has a nice balance on the skin so it doesn't feel overload with greasy heaviness. You can adjust the dosage according to your personal needs and that something I favour in an oil blend. My skin bounces somewhere between dry and parched of all moisture with flakiness and eczema patches. It's a fickle one to please at the best of times but Harmony can assist with restoring and repairing. Harmony is just one of ten oils from Joanna Naturals so depending on your skin type I am sure you can find an ideal match. I'm often approached by readers who experience rosacea so you'll be pleased to hear that the range includes "So Calm" which is blended for this skin type. It's a short and sweet write up but I feel more than happy to recommend Joanna Naturals based from my experience.